Iceland on the Nils Klim map! Map over the Nordic region. This years' shortlist is ready and the Nils Klim Committee is well under way with their work. Icelandic candidates are on the list, for the first time! 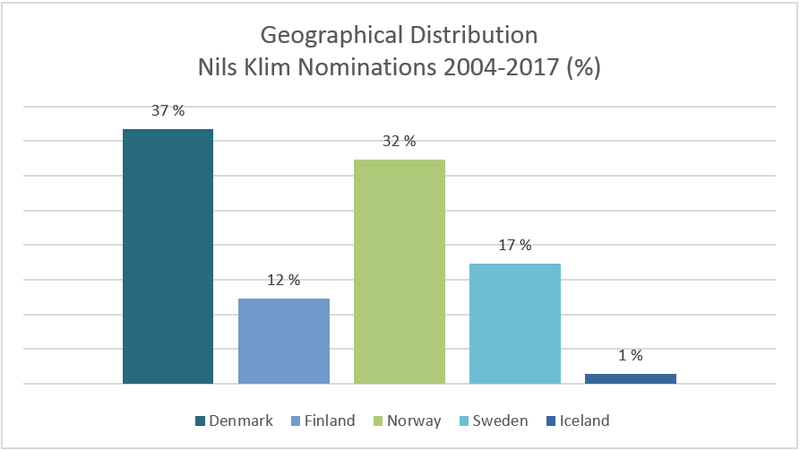 The Nils Klim Prize is awarded annually to Nordic scholars under the age of 35, for outstanding contributions within the arts and humanities, social sciences, law or theology. By the 15 June deadline a total of 10 nominations had been submitted for the Nils Klim Prize 2017. This is the first time Icelandic candicates have been nominated for the Prize. With regard to academic distribution, most of the candidates are from the humanities and social sciences, but there is also one candidate from the field of theology. The Holberg Organization has conducted promotional tours to both Iceland and Finland in 2016. The purpose of these visits has been to increase awareness of the Holberg Prize and the Nils Klim Prize. In Helsinki, an event at the Norwegian Embassy was held on 29 January, following a Nils Klim Committee meeting. At the event, Professor Elina Vuola of the University of Helsinki spoke on the topic "Excellent, effective and extraordinary? Humanities, the university and young scholars today." The second event took place at the Nordic House in Reykjavik on 2 February. Chair of the Holberg Board Sigmund Grønmo held a presentation on the Holberg Organization, while Nils Klim Committee Chair Frans Gregersen spoke about the Nils Klim Prize specifically. Subsequently, Dr. Eirikur Smari Sigurdarson, Research Director at the School of Humanities, University of Iceland, gave his comments on how to succeed in obtaining nominations for the Nils Klim Prize from Iceland in the future. The Holberg Organisation is pleased to see results form these events. The Nils Klim Committee recently decided on this year’s shortlist, and is presently assessing the candidates. They will meet for a final discussion in mid-January. At this meeting they will decide on their recommendation, which is then put forward to the Holberg Board, which makes the final decision. The Nils Klim Laureate will be announced by the Holberg Board at 09:00 (CET), 14 March 2017 in Bergen. The event will be broadcast online. Scholars holding a position at universities and other research institutions can nominate candidates for the Holberg Prize or the Nils Klim Prize. The 2018 nomination form will be made available in November. Visit the dedicated page for more information about the nominaton process.